White Bay Cruise Terminal (WBCT) is located at James Craig Rd, Rozelle NSW 2039. Download this map for directions to White Bay Cruise Terminal. How do I get to White Bay Cruise Terminal? Road and ferry access is the best options from the city. To reduce the impact of traffic on our neighbours, public vehicle access to White Bay Cruise Terminal on cruise ship days is only available via The Crescent / James Craig Road and NOT by Robert Street in Balmain. Instead, enter James Craig Road via The Crescent and follow the signs to the terminal. Please ignore the direct route suggested by your GPS device as you will be denied access at the Robert Sreet gates and asked to return to The Crescent. Download this map for directions to White Bay Cruise Terminal on cruise ship days. Pick-up/ Drop-off areas are right outside the cruise terminal. On cruise ship days, please advise your driver they can only access WBCT on cruise days by taking James Craig Road via The Crescent and NOT by Robert Street in Balmain. How do I get home/ get to the airport from White Bay Cruise Terminal? The taxi rank is right outside. Ground staff will show you the way. You’ll be directed by ground staff to your pick up point. Captain Cook Ferries runs a service on cruise ship days between King St Wharf, Barangaroo and White Bay. If you have booked a limousine or private car, then you’ll be met outside the front of the terminal. Make sure you have the contact details of the company and ask them to call you when they arrive. Please advise your driver they can only access White Bay Cruise Terminal by taking James Craig Road via The Crescent and NOT by Robert Street in Balmain. You can check in online. If you haven’t checked in online then your cruise company should have provided you with a check-in time. Drop off your bags at the bag drop. 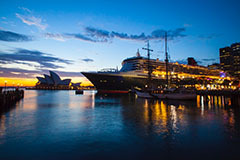 Be sure to be at White Bay Cruise Terminal an hour before you are set to depart. You will have to walk through a metal detector and your belongings will go through the x-ray. Make sure you take off and place in your carry-on luggage, your mobile phone, laptop computers/ tablets, and other large or small metal objects, coins, etc. If you have artificial devices, like hip/ knee replacements, pacemakers, etc. let the security people know as you approach. The security personnel will make the process as easy and as convenient as possible. How do I board the ship from White Bay Cruise Terminal? 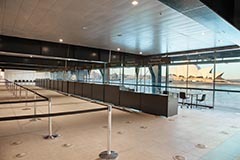 White Bay Cruise Terminal has a dedicated elevated gangway. What can I find around the terminal? 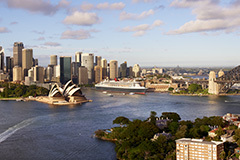 Sydney Destination Ambassadors will be able for international arrivals, to provide you any local information you might need. There are many restaurants, pubs, cafes, bars and shopping precincts nearby. Get a note from your doctor and contact the cruise lines and ask. What must I not bring? Anything prohibited, illegal, or otherwise dangerous. If in doubt contact the cruise line or have a look at the Australian Border Force. I’m not sure if I’m allowed to bring something? Other types of non-alcoholic drinks, water, etc. Heating elements, kettles/ irons, etc. Where can I park at White Bay Cruise Terminal? There are no long-term parking options at or near White Bay Cruise Terminal. We have short-term pick-up and drop off access only. There are no luggage storage facilities at or near White Bay Cruise Terminal. Make sure you know what time your cruise line intends to open bag drop, usually around 09:00 through the day until an hour before the ship is set to depart. Can my family and friends come to see me off on my cruise? 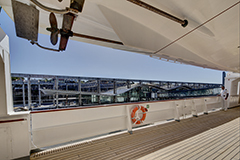 Family and friends are welcome to share in your excitement and wave farewell from the arrivals area of White Bay Cruise Terminal or the patio area of the café. Unfortunately, they will be not be able to come past the check-in area of the terminal building or on-board. Just like an airport, you’ll need government issued identification, passport is always best, but if you’re going on a domestic cruise, an Australian driver’s licence, or equivalent is a must. Tourist Refund Scheme (TRS) is available immediately after you clear Customs/ Immigration. Don’t forget to have a printed receipt of your purchase.